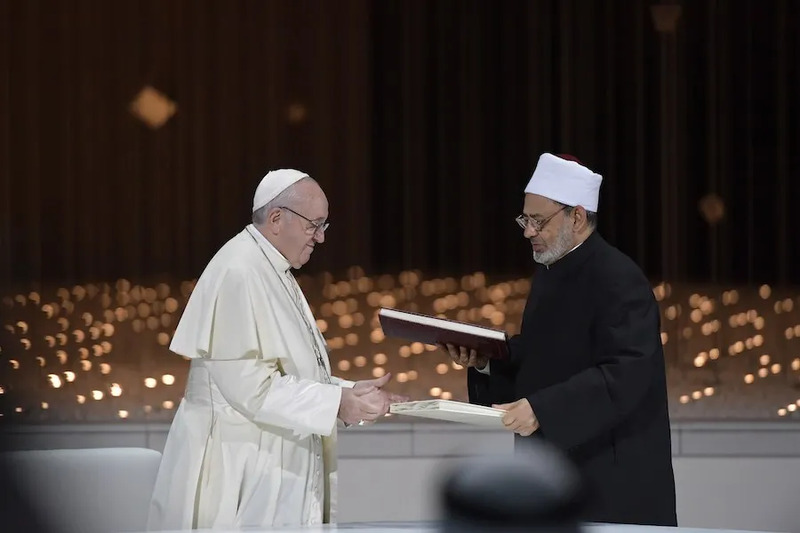 Abu Dhabi, United Arab Emirates, Feb 4, 2019 / 05:08 pm (CNA).- Catholics, Muslims and all who believe in God must work together to build a culture of love, peace and human fraternity, Pope Francis said in a joint statement he signed with Ahmed el-Tayeb, Grand Imam of al-Azhar, during an interreligious meeting in Abu Dhabi. The signing took place Feb. 4 during Pope Francis’ visit to Abu Dhabi, capital of the United Arab Emirates, a trip intended to promote interreligious dialogue and give support to the country’s Christian minority. Francis is the first Pope ever to visit the Arabian peninsula. The document discussed the importance of religion in building a peaceful and free society and the challenges of an increasingly secular world. It condemned all practices and policies detrimental to human life and freedom.